You can begin pre-ordering the Galaxy Note II today from U.S. Cellular for $299.99 with the release set for late October. 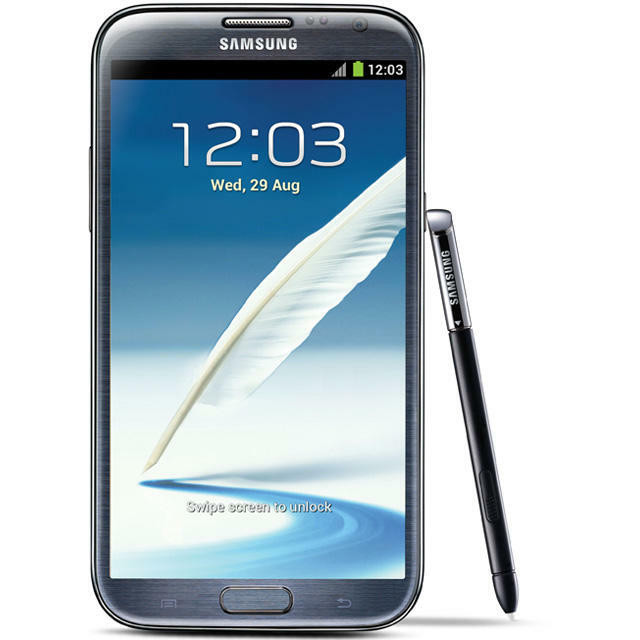 Samsung announced this morning that the Galaxy Note II is coming to five major U.S. carriers, but it is leaving it up to each of them to announce the pricing and release date. While we have received press releases from Sprint and T-Mobile so far about the device, neither of them chose to provide that info. So, kudos to U.S. Cellular for being the one to at least give us some insight. U.S. Cellular will have the 16GB Titanium Gray Galaxy Note II in late October for $299.99 after a $100 mail-in rebate. Pre-orders begin today online with in-store sales following later. Seeing as U.S. Cellular's pricing falls in line usually with the other carriers, this at least gives us some idea of what we can expect from the other four when they get around to announcing it. Apparently big phones come with a big price, even when subsidized. CHICAGO (September 19, 2012) – U.S. Cellular (NYSE: USM) and Samsung Telecommunications America (Samsung Mobile), the No. 1 mobile phone provider in the United States, have announced the 4G LTE™ Samsung Galaxy Note™ II will be available for customers to preorder today at uscellular.com/note2, and it will be in stores and online in late October. The 16GB Titanium Gray Galaxy Note II will be $299.99 with an instant rebate for those who purchase during the online presale. It will be $299.99 after $100 mail-in rebate when it arrives in stores. Customers who purchase the Samsung Galaxy Note II from U.S. Cellular receive benefits no other carrier offers, including new devices faster without continuously signing contracts, free Battery Swap and the only points-based rewards program in the industry. The Samsung Galaxy Note II joins U.S. Cellular's cutting-edge line-up of devices that also includes the award-winning Samsung Galaxy S® III. Galaxy Note II is designed to enhance the standards of performance, productivity and power in a unique device that combines a powerful smartphone with the best functionality aspects of a tablet. The Galaxy Note II's brilliant 5.5 inch HD Super AMOLED™ touchscreen allows for easy viewing of websites, video, crystal clear pictures and videos with vibrant color rendering. Smooth multitasking, fluid gaming and faster navigation will also be noted with the U.S. debut of Samsung's Exynos 1.6 GHz quad-core processor in combination with Android™ 4.1 (Jelly Bean). The S Pen creative tool, a long-lasting 3,100 mAh removable battery, an 8-megapixel rear-facing and a 1.9 megapixel front-facing camera with HD video recording and an additional 64GB available with microSD™ card are just some of many features users will enjoy on this premium mobile device. "The Samsung Galaxy Note II on the fast 4G LTE network provides our customers with a unique experience that can make work and play easier wherever you are," said Edward Perez, vice president of sales and marketing operations for U.S. Cellular. "We are once again excited to work with Samsung to bring this caliber of device to our customers to help them stay connected to the people and information important to them." The Galaxy Note II is an advanced and versatile device designed to enhance and simplify your life. It is the ultimate multi-tasker, with its unique Pop Up Play picture-in-picture feature allowing users to watch a video while reading an email or sending a text message. Pop Up Note lets users open an S Note instantly as a pop-up window anywhere on the screen to jot down a quick note during a phone call or other live services. Using the S Pen along with Air View, customers can conveniently and quickly browse photos and documents without opening up folders. The device also features S Beam NFC sharing capability and the Smart Stay eye tracking feature made popular on the Samsung Galaxy S III are also available on the Galaxy Note II.